Webbee is a desktop based SEO spider that crawl your website following the pattern of major search engine bots. It searches every nook and corner of your website and collects data for you to spot fruitful opportunities and critical issues that can be turned into major benefits. Download it today to find out the exact steps to turn your site into a traffic magnet. What is SEO Spider Tool? Webbee SEO Spider is an ultimate web spider that crawls your website with respect to major search engine’s guidelines. It gathers everything from your website that can be used to form a perfect search engine strategy for your website. Our spider is capable of crawling titles, headings (h1 to h6 with their frequency), http and https URLs, status codes (200 OK, Redirects, 404 pages, server errors), page types (images, html, css, JS, flash, PDF), GA codes, robots denied webpages, meta robots, all internal links, all external links, links frequency to internally linked pages, all anchortexts and their frequency, keywords used in all forms and their frequency, sitemaps, images alt tags and images without alt tag. It also has the capability to crawl status codes only. What Webbee Spider is Capable of? Webbee, a powerful SEO Crawler Software, can accomplish following tasks. User can have all HTML data like URL status codes, content type of webpage, title, meta description, all headings and their occurrences, Google Analytics code, schema (microdata), canonical URLs, meta robot tags and internal & external links. Webbee also crawls all the keywords used in titles, h1 and anchor texts and audit them to check if they are overlapping with any other webpage or not. User can easily extract all the keywords from competitor’s website. How competitors have implemented schema and what types; webbee crawl it and sort it into tree form for easy understanding. Whatever the length of your sitemap is, webbee will crawl it in seconds and provide you URLs with their last modified date, change frequency and crawl priority in tabular form. It crawls all, internal and external, links; sort them and gives users the option to check which page has links coming from other internal webpages. Meta data and their duplication can be checked with Webbee SEO Spider. If you have a huge list and wants to check only the status codes; webbee has “Header Status Code” for you in this regard. This mode is super-fast as it gets only the status code from URL. If you want to allow or disallow some of the URLs or directories from crawling then custom robots.txt feature is waiting for you. Use custom robots.txt for crawling and get a perfect crawl! Google Webmaster Tool allow you to download only 1000 404 (not found) URLs from panel. But, Webbee spider has Google API implemented that lets the user download all 404 URL list directly from your webmaster account, even a hundred thousand. It has awesome download features that allow user to download all the reports with just one click. All the reports in your system! It crawls all the images from website and sorts them in 2 different sections; with alt tags and without alt tags. One click installation and it’s ready to go. Just download the Webbee SEO Spider executable file. Double click the setup and install it in your selected location. Its Done! Feel the joy of GUI updating. With the help of this Feature, you can easily update the GUI of the WeBbee with single click. Give a whole new look, feel a difference. Just one step ahead from being audited your website. Download, input, click and go. Here you got the best summarized data for analysis. Search Engine Optimization has lot more to do with custom Crawl. Crawl the website as you want to. By default configured settings have generically set. For custom crawling see user guide. Don’t worry. Its easy. We won't leave you after you purchase the tool. Our support team is at your service when you need them. Retrieve all keywords of your/competitor with WebBee, keywords placement and their conflicts summary. Test which robots.txt file is best suit for your website by allowing and disallowing different parameters in URL. 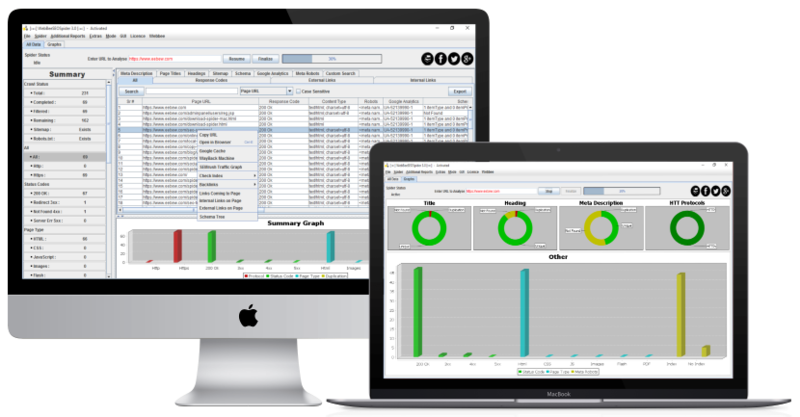 Download advance Reports with WebBee and make your audit more accurate. Get crawl summary on your computer with single click. Today is the day to save time and get faster. Get your website’s sitemaps crawled with one button click and save your time. Get SEO Knowledge on search basis in Keyword Intelligence Mode and update your knowledge with this extra ordinary feature. Do website audit with one click. Analyse the reports and implement the suggested changes. This was not that easy before. Or sign up here for one month free trial. No Credit Card Required! Webbee has five 5 different crawl modes. These modes provide you the flexibility in crawl your website Read more.. This spider has option to crawl your website with custom user agents. To know about available user agents Click here..
We’ve been extremely impressed with Webbee SEO Spider. The data was very helpful for us to analyse our as well as competitor’s websites. We now have clearly defined strategies about what to do. Highly recommended by SEO Marketing Company. We guarantee the quality we provide to our customers. User satisfaction is our first norm.